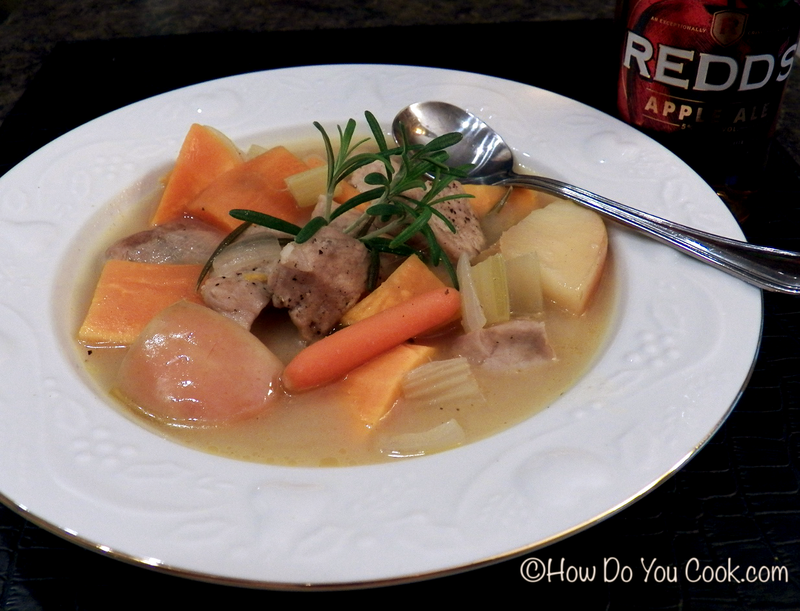 For day four of Soup Month 2013, we have a hearty autumn soup complete with sweet potatoes, juicy apples, baby carrots, lean pork sirloin and to top it off, a bottle of apple ale. All of the ingredients combine to create a perfect blend of fall flavors. What's great about a hearty stew like this is that the flavor gets even better as it sits. All of those distinct flavors combine and intensify and create a wonderful broth. Leftovers, if there are any, are delicious, so this is a great weekend meal that you can enjoy for lunch during the week. Serve with a loaf of crunchy French bread and a cold bottle of Redds Apple Ale or a glass of good crisp Chardonnay like a Rodney Strong Chalk Hill Reserve 2009. Preparation time for this stew is just about an hour, and this is a really easy recipe to make. For the beer we chose a Redds Apple Ale, but you could use any good ale or cider beer. The next time I make this I'd like to try it with Angry Orchard Hard Cider or maybe Strongbow Cider, both of which sound excellent. Enjoy!! In a large pot melt the butter over medium heat, add the pork to the pot and cook until browned. Add the celery, onion and carrots to the pan, stir, then add the cumin, rosemary and black pepper to the pot. When vegetables are just tender, add the flour and stir to evenly coat all of the vegetables. Add the potatoes, apples, stock and beer to the pot and bring to a simmer. Lower the heat and cook uncovered until the potatoes are soft and the meat is tender, about 20 minutes. Remove the pot from the heat and let stand for 10 - 15 minutes before serving. This will allow the stew to thicken slightly. Ladle into soup bowls and serve. Beautiful soup, definitely perfect recipe for this time of year! Thank you so much! I loved all of the fall flavors, especially the apples and sweet potatoes. Yummy! This is a great fall soup. I hope you enjoy it as much as we did.